Strong Solar flares generate intense spikes in electro-magnetic radiation. Arriving at light speed just eight minutes after the blast, on impact such high-frequency electro-magnetic oscillation ionizes the upper atmosphere. The Sun facing side of Earth's vital aura gets ionized. For a split second the singular particles of Earth's atmosphere's are fused into one unified plasma field. These Solar pulses affect Earth as a whole and may cause radio blackouts. We're all deeply intertwined with Earth's aura, hence each living being receives a fair share of such boosts. 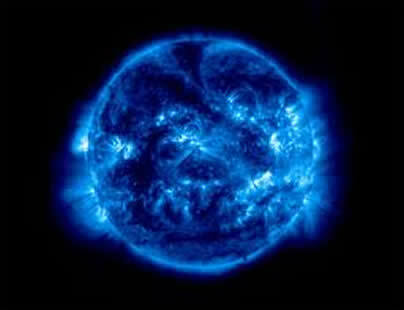 This extra energy may be preceived that everything vibrates, inside and out. A momentary overload throws us out of ruts and routines, thus possibly leading to emotional instability, upset or outrage. Huge Solar flares may herald big events. 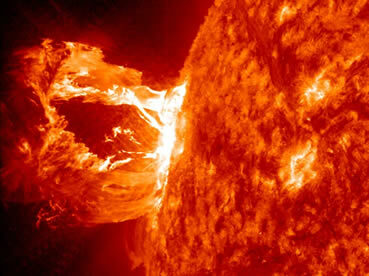 9/11 as well as many big earthquakes (like the one in Japan on March 11, 2011) were preceded by strong Solar flares. The NASA spaceweather site is great place to learn more about such events. According to NASA, sunspot 2192 was the largest and most active region in over 25 years. From October 18 to October 30, while facing Earth, this sunspot released 6 X- and 27 M-class Solar flares, pushing the energy levels up to critical marks, showering us with a pool of potentials. almost as if existence pulled out the red carpet, offering a royal reception for this key alignment which would set the pace for the coming six months. Saros Series #153, which this Solar eclipse was a member of was initiated in 1870 when the shadow of a first Partial Solar eclipse touched Earth's Polar region. Each Saros series is made up of a string of Solar and Lunar eclipses which are spread out over 1300 years. 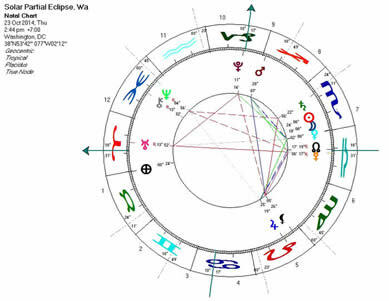 The first eclipse of a series acts as birth chart, sets off a fresh evolutionary intent, opens up a new chapter. 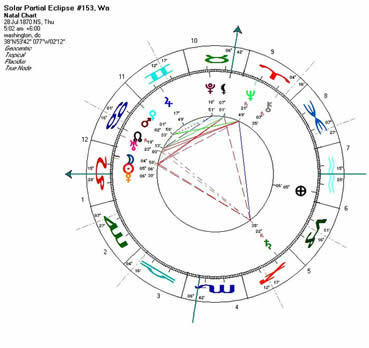 Analyzing the planetary alignments of the initial eclipse give clues about serendipities and challenges to manifest over the course of time. Looking back at latest eclipses of this series might even give a stronger clue of its inherent dynamic. The last three members of this series materialized in October 1996, October 1978 and in September 1960. 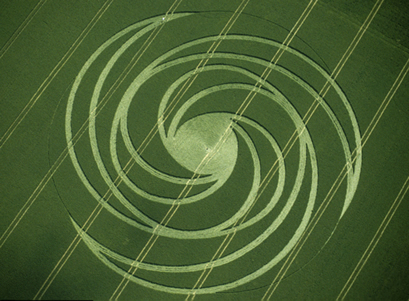 This exquisite Cropcircle (July 4, 1999, Hackpen Hill, UK) shows the pattern Solar eclipses of one Saros family are drawing on Earth's surface. Let's spend a minute looking at the initial eclipse of this series which occurred on July 28, 1870. First it's noteworthy that year 1870 staged some outstanding socio-political events. The American Civil War had ended 1865. Slavery had been abolished (1864), every citizen had been granted equal rights and protection by law (1868), and finally in 1870 everybody regardless of race or color was granted the right to vote. Furthermore, 1870 saw the first female judge and the first black senator. 1870 also was the year of first public screenings of motion pictures, opening of the first subway and the creation of the first US National wildlife reserve. In line with such liberal and forward looking tones, the initial eclipse of this series places foundations for some revolutionary and ground developments. What stands out is that problems and challenges seem to get looked at more directly. Radical and new solutions could gain traction and we might see an overall increased interest in social justice. The present member of this series, the October 23, 2014 Solar eclipse carries tons of Scorpio energy, which is the sign of focus and intensity. The coming months might be a time to gather courage to face demons. We might keep digging, persisting despite upcoming fears. Scorpio is the sign of investigation, every stone has to be turned over in search of roots and underlying causes. There's another unusual synchronicity coming into play over the coming months. The eclipse New Moon started the trend. The coming three New Moons too occur at the zero degree mark (Sagittarius, Capricorn and Aquarius). The initial degree of a zodiacal sign is indeed special. Here the energy is yet unformed and raw. All options are open, many possible roads can be taken - however there are no maps to go by. Unprecedented situations may demand spontaneous and creative solutions. We may get challenged to rekindle a pioneering spirit, and we do best in synchronizing heart and mind. It helps to remember that nature's intelligence is supreme. Even though situations might be difficult we can be assured we get what we need at the exact right time.